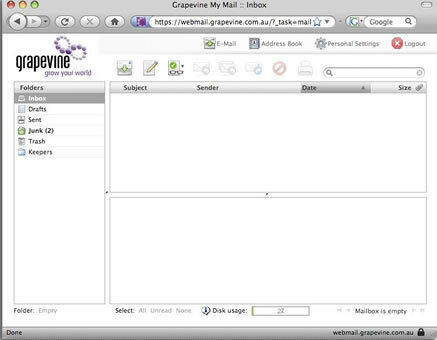 Below are the step-by-step instructions for using Grapevine Webmail. 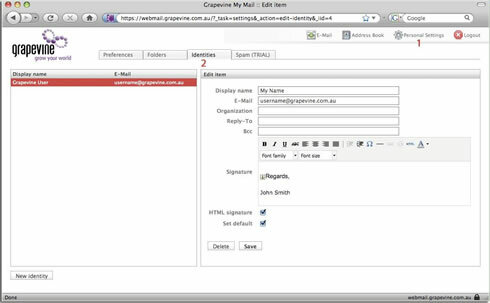 1) To access your Grapevine email via a web browser, simply launch your browser and visit https://webmail.grapevine.com.au/ or http://www.grapevine.com.au and click on the web mail link. Enter your Grapevine Username (first part only). Select which domain you have in the pulldown menu. Read incoming email stored on the mail server. Allow you to compose and send email messages. Allow you to compose and send email messages and attachments. Sort and pre-read emails prior to downloading them to your computer with an email client. 4) Changing your appearance name and making a signature. You can customise your name and place a default signature at the bottom of all your emails by simply following these instructions. Click on the "Personal Settings" Link at the top right hand section of the webmail page. Click on the sub-section heading "Identities". Select your Identity to enable you to edit. 5) Making alterations to your settings. 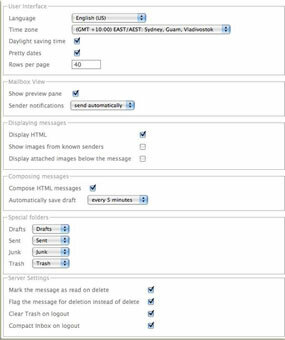 You can customise the look and feel of the webmail facility once authenticated by clicking on "Personal Settings" link at the top right hand section of the page. You have successfully set up your email on Grapevine.